In spring and summer, bright flowers surround this plantation house named for its location on a horseshoe bend in the Deep River. The house (ca. 1770) was owned by Philip Alston, whose band of colonists seeking independence from Britain was attacked here in 1781 during the American Revolution by British loyalists led by David Fanning. 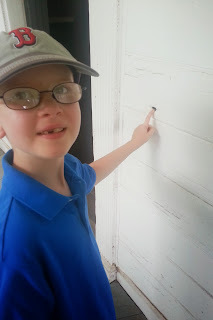 Took my son for a long-ish drive out of Fuquay into the back country (some Triangle residents may be cocking an eyebrow thinking Fuquay is 'the back country') to see a Revolutionary War battle re-enactment at the historic Alston House out in Sanford, NC. I'll let the links tell the story but, in brief, Alston house was the site of a skirmish between Fanning's Loyalists and a Patriot militia led by Philip Alston. The house came within a straw cart's breadth of being burnt down in the battle. Alston's militia surrendered though, the house was spared, and remains today as one of the few houses where a Revolutionary War battle was fought that still stands. It was a beautiful summer day; the weather cooperated splendidly. Hot in the sun, there were plenty of great old trees around the property providing shade and a steady breeze to keep us from overheating. Born in Connecticut, I'm not easily impressed by colonial era housing and historic markers with dates like 1761 affixed. They were a dime-a-dozen in our neck of the woods. Heck, my father lived in one of those old houses for a while, complete with low ceilings, bowing floors, and latches on the doors. 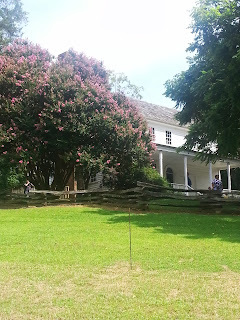 This house, while not spectacular, is in a scenic location, is generally well-preserved -- it was the house of Governor Benjamin Williams (1799-1802, 1807-1808) -- and has the distinguishing characteristic of being riddled with musket ball holes. The friendly and knowledgeable support staff and the re-enactors deserve hearty congratulations for putting together an informative and enjoyable event. We had a great time and so too did the large crowd out at the house for the day.